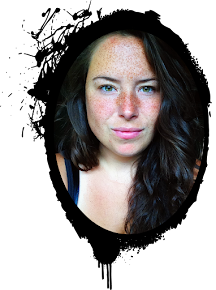 Here's a fun project. 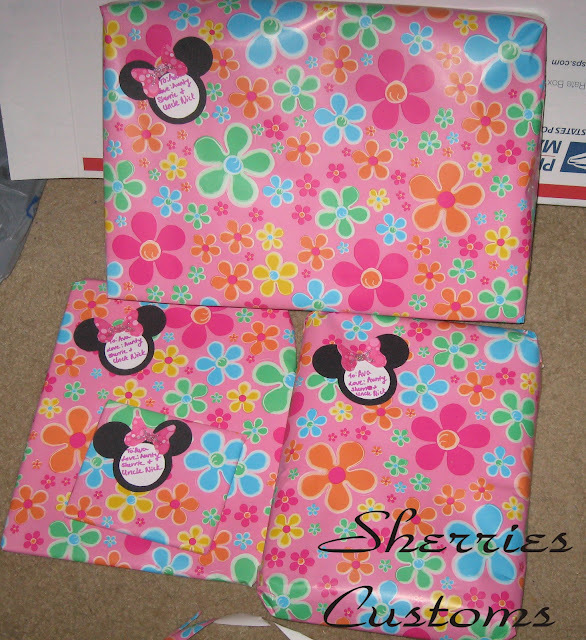 I recently had to get gifts for my niece's birthday and the theme of the party was Minnie Mouse. Cute right?? Well, not when you can't find wrapping paper or tags that match the theme!! So that is what inspired this project. I bought cute pink flower wrapping paper and decided to make my own tags. I wanted to cut the head design out with my cricut. Wonderful machine! I'm so spoiled and lazy now when it comes to cutting things out because of it. lol Anyway, the cricut is great, but the cricut craft room not so much. I use that program to group objects and cut them out. 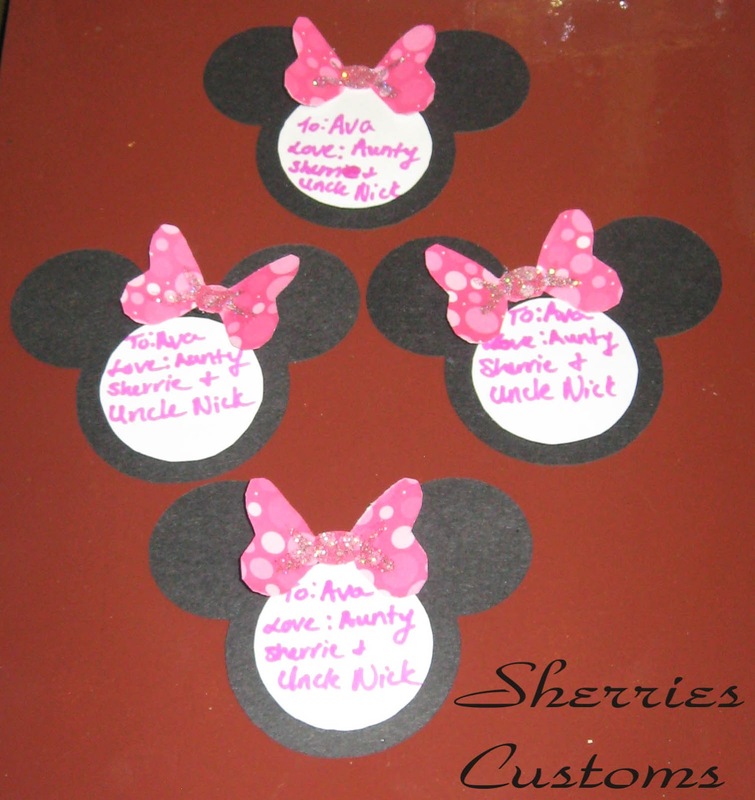 For example for the Minnie mouse head I took 3 circles and grouped them together to make the design. Then just I hit cut and the machine cuts them out for me. Well that's what is supposed to happen.... I laid it out so the cricut would cut 4 of the heads out at once. Well it cut the first 2 out fine, then it stopped. I got an error message and the computer fun began. After 30 mins of trying over and over to cut it and just getting the error message that would shut the program down and no cutting happened at all, I finally restarted the computer. I was able to cut the last 2 designs before the error messages started up again. 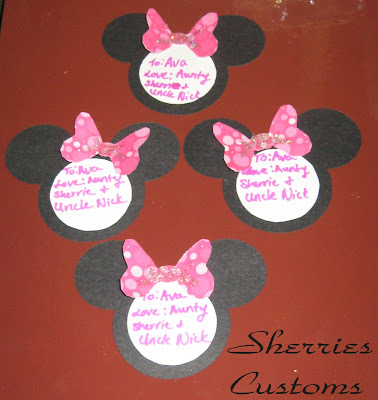 After the black Minnie heads were cut out I needed to cut white circles so I could right all the info on them. Again this should have been a simple job, but wasn't. It cut 2 circles out like before and the computer started with the error messages. That was about all I could handle I shut down the computer and the cricut. Then went at it the old fashioned way and cut everything out by hand. I am so bad at cutting circles out (that's why I have the cricut in the first place! ), but I managed. 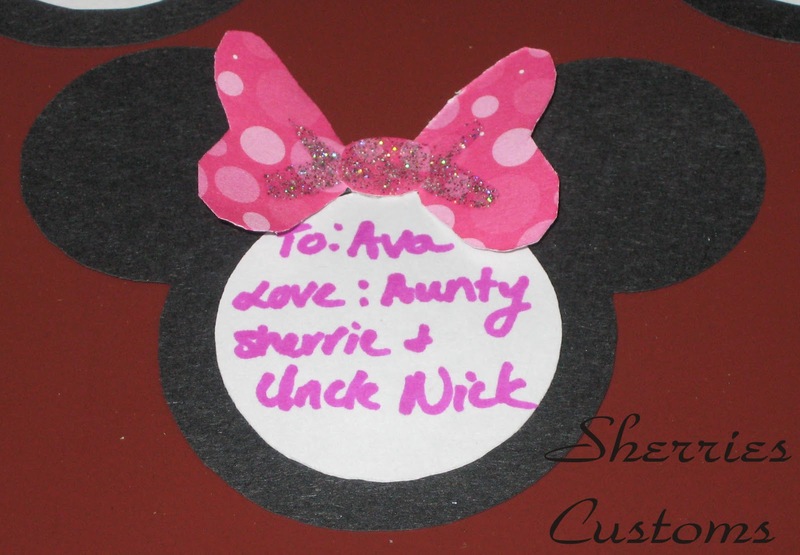 When it came to the bows I took a piece of pink poke a dot paper and cut a strip out of it about 2 inches wide and the length of the paper. I folded the strip accordion style making squares measuring about 2 inches. Once I had 4 squares I folded the squares in half and cut on the folded side of the paper, cutting out a half bow shape. when I was done I unfolded the paper and had 4 even bows. I didn't like how the middle of the bow came out. So I cut out little rounded squares to put over them. It ended up being a great mistake, because the bows looked more three dimensional. 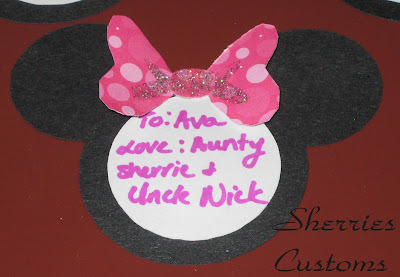 I wanted to jazz up the bows and put glitter on them. I didn't want to make a mess so I took glitter nail polish and glittered them with that. It worked out great and was mess free!! After that I glued all the parts together and wrote on the tags. I did have a lot of fun making these. I wish the cricut craft room would have cooperated with me, but that's life. They came out so cute and really brought the theme of the party together.